9-1-1 is the only number that needs to be called during an emergency at Palliser Park. Dialing 9-1-1 on a payphone does not require any coins. While cellular service remains a problem for Palliser Park both at the marina and during the busy season, SaskTel has assured us that cellular calls to emergency services take priority. A cellular call to 9-1-1 will go through, regardless of how busy the service is. That being stated, in case of emergencies, land lines are available at the Pool, Concession, Golf Course, Marina Store, and the Admissions Gate during business hours. Main Campground - located in front of the concession close to the fence that surrounds the Pool area. Rusty’s Coulee Marina - located at the Store just outside the compound. In the event of an emergency and these payphones are not quickly accessible, some cottage owners have land lines as well. Do not hesitate to seek assistance! When calling 9-1-1 from the park, remain calm! Remember - quick, accurate information saves lives. If possible, advise the operator that emergency responders will be met at the Admissions Gate and escorted to the emergency, then send someone to the Admissions Gate. 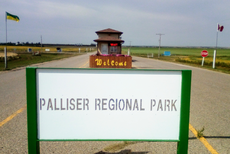 Palliser Regional Park is serviced by the Elbow Community Detachment (Outlook) of the RCMP. In the event of an emergency, call 9-1-1. If you require police assistance for any other reason, call (306) 854-1830 or (306) 867-5440. The tank sits on a trailer that requires a vehicle with a 2-inch ball in order to move it. Please familiarize yourself with the current location of this tank prior to any emergency situation.